On this showing, the composer, Ricardo Castro, maker a good fit with Sterling's 'Mexican Romantics' banner. He was born in Nazas, Durango, Mexico, into a family with sufficient means to get him a piano professor to test and nurture his talents. He studied at Mexico's National Conservatory of Music. His impeccable keyboard technique lead him to the New Orleans World Fair in 1885 and concert engagements across the USA followed. He composed compulsively. There were two symphonies during the 1880s and much else. As pianist he led many premieres in Mexico City, including the Grieg Piano Concerto and the Schumann Piano Quintet. In January 1893 he was in Paris and there saw his Cello Concerto premiered. Tragically, within months of his being appointed director of Mexico's National Conservatory, he died of pneumonia. He barely lived into middle age, not that this is any guarantee of musical worth. Sterling tell us that these three works are the first examples of a piano concerto, cello concerto and symphonic poem in Latin America. All three are performed live with an unobtrusive audience, the presence of which is signalled by applause at the end of each piece. The Piano Concerto is storming and full-blooded with a poetic and glittering slow movement. The ideas are good: listen to the self-effacing charm of the sauntering orchestral pages of the first movement before the piano's commanding entry. The finale is a Polonaise-style piece in an idiom in the same territory as the concertos and concertante works by Gottschalk, Saint-Saëns and Arensky. 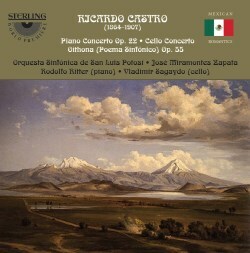 The pianist Rodolfo Ritter acquits himself admirably as he did in the two Ponce piano concertos on Sterling (CDS1102-2 - review). The orchestra's violins are respectable even if, in the piano concerto, they tend towards a fierce tone at fff. In those instances they could do with more caramel and less jalapeno. The Cello Concerto is also in three movements. It has a sweet yet aristocratic Andante and a great deal of smoothly suave writing not that far distant from the Dvořák cello concerto and the little cello and orchestra pieces by Frank Bridge; not Oration. I had thought it might have echoed the concertos for the instrument by Lalo and Saint-Saëns but Castro comes up with strong memorable material instead. It's a cut above - quite a discovery. The orchestra are here in better fettle than in the Piano Concerto and the more than capable cellist, Vladimir Saygardo, seems to enjoy putting the work across. I thought the name Oithona — after a poem by James Macpherson, itself based on a Celtic legend — rang a bell. It forms the basis for an opera (unrecorded) by British composer Edgar Bainton (1880-1956) which was produced by Rutland Boughton in Glastonbury in 1915. Castro's symphonic poem on the subject is a tempestuous affair which would be a good match with Tchaikovsky's Hamlet. Here it's certainly given a raw, hustling account, mordant yet in touch with many poetic moments. It's only a little longer than a concert overture. The orchestration is pleasingly artful. The very full liner-notes by Jose Maria Alvarez are quite properly in Spanish first and then English. They are of the factual and musical depth one finds in Toccata's CDs. Sterling's Bo Hyttner and Snr. Alvarez should take a bow. That such enjoyable music was being written in these circumstances is a revelation. Discovery and delight are not always companions but they are on this occasion.